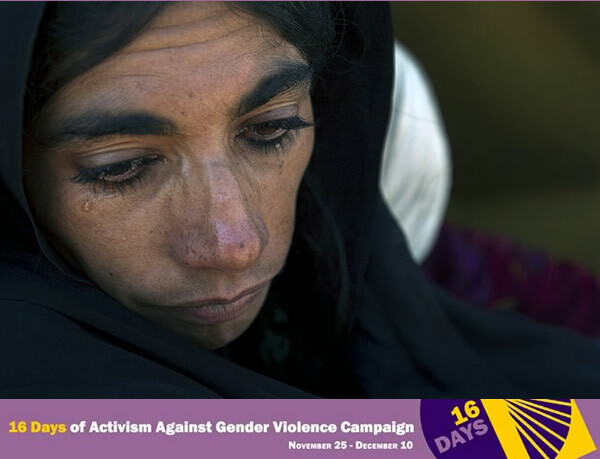 The Afghan Women’s Writing Project is pleased to join the 2017 Sixteen Days of Activism Against Gender Violence, the international campaign to challenge violence against women and girls. The campaign runs from Nov. 25 through International Human Rights Day on Dec. 10. This year, the campaign’s theme is “Leave No One Behind: End Violence against Women and Girls”. In this section we present to you the published writing by dozens of our writers about violence against women in Afghanistan over the last five years. Read My Heart Hurts by Sharifa, a young working woman and student who writes on behalf of the many Afghan women whose voices are not heard. With the 2015 stoning of young Rukhshana in northern Afghanistan and the mob beating death of Farkhunda that year in Kabul, she had plenty of evidence to make her case for the dismal plight of women. In For Rukhshana!, Pari offers her interpretation of the unthinkable stoning sentence issued by the religious mullahs in northern Afghanistan. Videos surfaced of the 2015 stoning, leading to a tremendous public outcry. Many Sides to Gender Violence in Afghanistan, by Shogofa Az. Change for Mariam, Change for Women, by Fariba H.
Please click these links for AWWP’s earlier contributions to the 16 Days campaign.